I’ve been frank in past blogs about the many issues I have with the Biggest Loser franchise, so I’ll spare you my rants in this post. Instead, in the spirit of the wildly popular show, I’ve found a real-life biggest loser…and she’s a friend of mine! My girlfriend, Kimberly Eberl, asked me for a dietitian referral, so I suggested she see Dawn Jackson Blatner, RD, in Chicago. Dawn is a colleague of mine whom I knew would have the personality and professionalism to inspire Kimberly to make some small changes that could add up to big weight-loss rewards. During their initial one-on-one sessions, Dawn provided insights into Kimberly’s current diet, exercise, and overall lifestyle patterns to identify the ways in which Kimberly was sabotaging her diet and health. She also focused on how you can use positive messaging and self-talk—rather than being down on yourself for slipping up—to keep your entire weight-loss journey positive and rewarding, rather than a big bummer. Armed with meal plans, a daily calorie limit, and healthy shopping lists and tips from Dawn, Kimberly made several changes that have added up to, well, big weight-loss rewards. She started to follow a balanced, 1,500-calorie-a-day plan filled with healthy fruits, vegetables, and lean protein, and lots and lots of water and other calorie-free fluids. Since she was used to eating about 2,500 calories or more per day and had basically been sustaining her current weight, Dawn calculated that the new plan of 1,000 fewer calories a day should result in a safe, 2-pound-per-week weight loss. And although Kimberly first lost weight in 5- or 6-pound-per-week increments, that slowed to a steady (and healthy) 2 pounds per week after about a month. 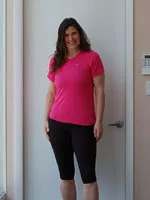 At six months, Kimberly is 50 pounds lighter and hasn’t felt this good in years. Here are some of her best tips to lose big. A registered dietitian can evaluate your current eating pattern and develop strategies that work as part of your lifestyle, using what you already like to eat. 2. Drink lots of calorie-free beverages. Stick with eating at regular times during the day, rather than snacking all day or skipping meals. 4. Exercise is not an excuse to pig out! You still have to watch what you eat, even if you exercise a lot. Kimberly runs marathons and even ultra-distance events, but she realized that she used junk food and treats as rewards for her exercise. Once she started focusing more on her diet than exercise, she found the weight really started to drop off. 5. Do the calorie math. The real reason why Kimberly had so much success is because she calculated, with the help of a professional, how many calories she needed to consume and burn off every day in order to lose weight at a safe rate. For her, and for many other women carrying around some extra weight, that means downsizing by about 500 calories a day. See what a 1,500-calorie-a-day meal plan looks like, and find other creative ways to consume fewer (or burn extra) calories. I also asked Kimberly’s dietitian, Dawn Jackson Blatner, for her own list of advice. Here’s how she helps her clients shed the weight and learn to love a healthier diet. Always motivate clients (and friends) with positive, not negative, reinforcement. You’ll be less likely to cheat on your diet if your taste buds stay satisfied. Try at least one new and exciting healthy recipe each week so you don’t find yourself eating boring baked chicken and salad every day. 3. Mix up your workout sessions. Try two to three different workouts per week to keep things fresh. Blend together a variety of activities such as a walk outside, jump rope, bike ride, or a fun exercise dance DVD. 4. Set goals and rewards. Work on one goal at a time and be sure to give yourself a (diet-friendly) reward for each behavior you successfully change. For example, once you successfully decrease your soda-drinking, treat yourself to a movie or manicure. Then start working on limiting after-dinner snacking, with a reward of buying a new book or earrings. If you are feeling the beginnings of a burnout, enlist the help of your healthy friends to motivate you. Start exercising with them, share workout music, or ask them for some new recipe or snack ideas to pump some excitement into your routine.